Preheat oven to 450°. Rinse chicken wings and dry with paper towels. (Dry the wings really well to get crispier skin) Place the wings in a bowl and lightly coat with the oil. On a foiled covered sheet tray, lightly coat with a non-stick cooking spray. Arrange wings in a single layer and place in the oven. Cook the wings for 45-55 minutes, turning the wings over every 15 minutes to brown them evenly. Remove cooked wings from the oven and place in a large bowl. 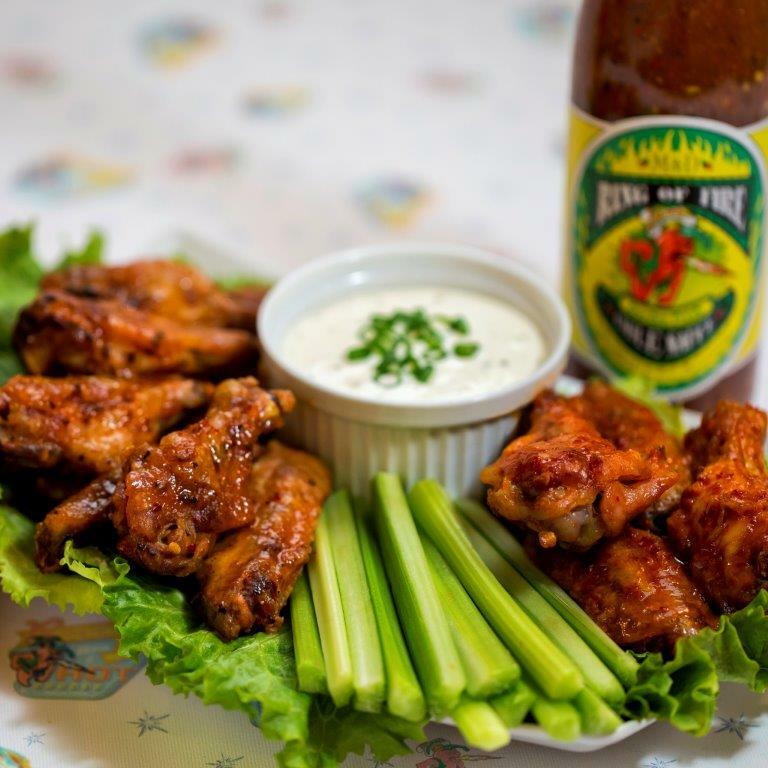 Pour melted butter and Ring of Fire ® Hot Sauce over the wings and lightly toss until thoroughly coated. Makes 2 servings. Preheat oven to 450°. Rinse chicken wings and dry with paper towels. (Dry the wings really well to get crispier skin) Place the wings in a bowl and lightly coat with the oil. On a foiled covered sheet tray, lightly coat with a non-stick cooking spray. Arrange wings in a single layer and place in the oven. Cook the wings for 45-55 minutes, turning the wings over every 15 minutes to brown them evenly. Remove cooked wings from the oven and place in a large bowl. Pour melted butter and Ring of Fire ® Hot Sauce over the wings and lightly toss until thoroughly coated. Get the latest spicy news. Thank you for signing up !